Think following the Low FODMAP Diet means you can’t have your favourite comfort foods? As long as you’re ready to get creative, there are lots of ways to bring normal looking foods back into your diet. Case and point is this savoury low FODMAP arugula and prosciutto pizza. 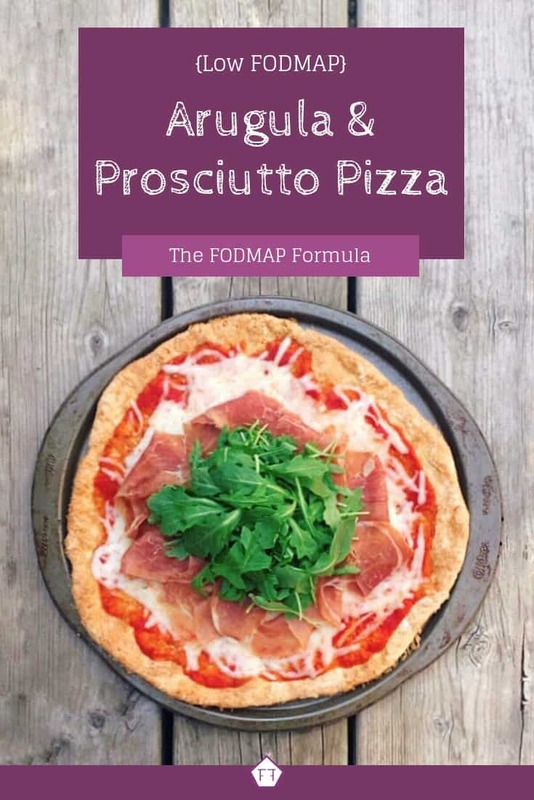 Made with a homemade low FODMAP pizza crust and FODMAP friendly toppings, this pizza will have your non-FODMAPing friends enviously eying your leftovers. Since this recipe makes two pizzas, you can share if you want to. Or not. This pizza is pretty delicious. Think this low FODMAP arugula and prosciutto pizza sounds great, but you don’t have time to try it now? Don’t worry. You can PIN THIS POST for later. 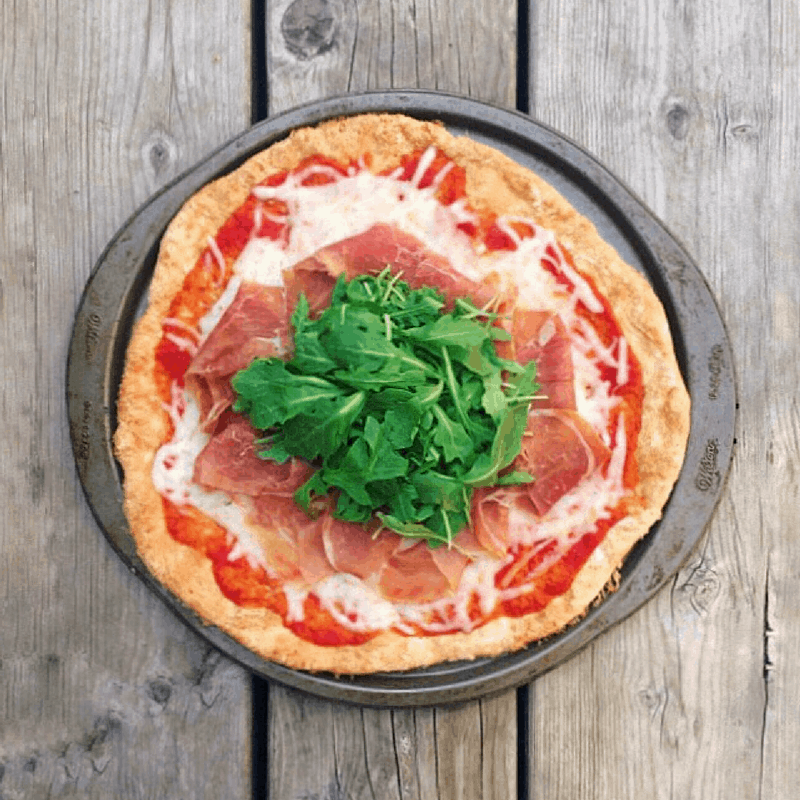 This low FODMAP arugula and prosciutto pizza is the savoury pizza you’ve been looking for. Check out the tips below to keep this recipe FODMAP friendly. First, if you’re in the elimination phase, make sure to use gluten-free flour. For my Canadian peeps, I like PC’s gluten-free flour. I like it because I can use it cup for cup and it makes a nice fluffy crust. This pizza crust recipe also uses xanthan gum. Even though xanthan gum isn’t a FODMAP, it can cause symptoms in some people. If you know you’re sensitive to gums, you might want to sit this one out. If you’re not sure how you handle gums, start with one or two pieces of pizza and see how you react before increasing your portion size. Next, choose a FODMAP friendly tomato base. I normally use a basic tomato puree. According to Monash University, 1/2 a cup of canned tomatoes is low FODMAP. Since we’re only using a few spoonfuls, you’ll be fine even if you eat the whole pizza on your own (’cause let’s be honest, that happens sometimes). Next up is cheese. Hard cheeses like mozzarella are low FODMAP in small servings because the lactose is broken down by bacteria during the fermentation process. Monash says mozzarella is safe in servings up to 1/2 a cup. This recipe uses 3/4 cups of mozzarella. If you plan on sharing your pizza, you can use a full portion. If you know you’re having a pizza for one, use a 1/2 cup of mozzarella instead. You can read more about Monash’s recommendations for dairy products here. We’re getting a little fancy with this pizza, so our final ingredients are prosciutto and arugula. According to the Monash app, arugula only has trace amounts of FODMAPs. So, you can pile on as much as you want, without adding to your FODMAP load. In case you don’t know, prosciutto is ham cured with salt. Since ham is a protein, it doesn’t have any FODMAPs. Make sure to double-check with your deli counter to confirm no high FODMAP seasonings have been added. If not, you’re ready to go. Since this low FODMAP pizza uses a thin crust, you may want to include a side dish, especially if you plan on sharing. I normally like to pair my pizza with a nice garden salad. If you need some lettuce inspiration, you can check out some easy salad ideas here. If you’re feeling a little daring, you could also pair this pizza with… more pizza. In which case I recommend you check out my low FODMAP Margherita pizza. 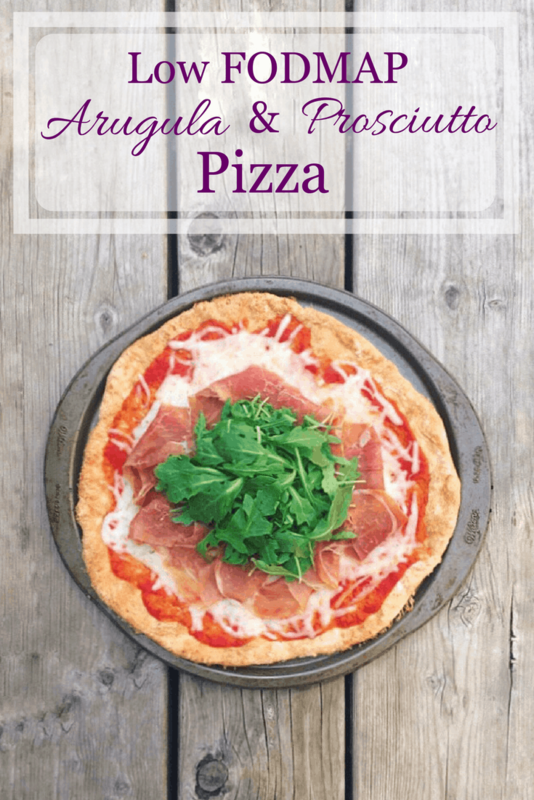 Want to try this low FODMAP arugula and prosciutto pizza? Don’t forget to PIN THIS RECIPE for later. Looking for a savoury FODMAP-friendly lunch or dinner idea? 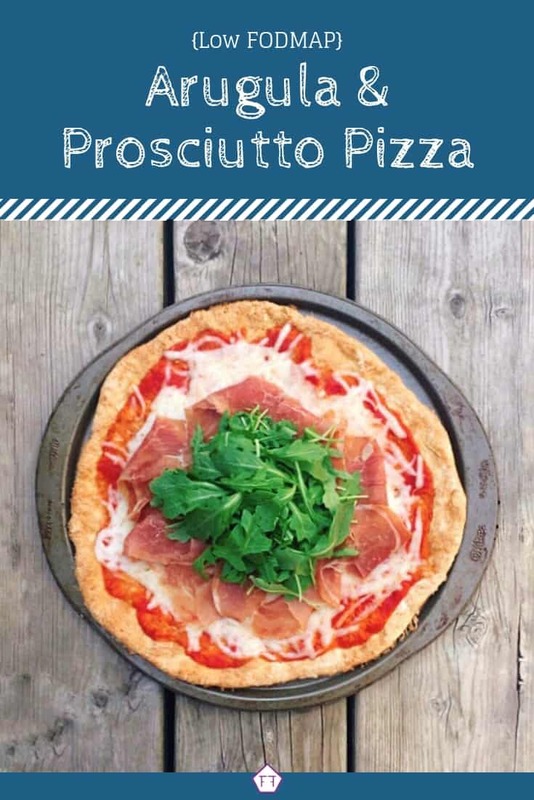 Try this low FODMAP prosciutto and arugula pizza! Made with fresh ingredients in the comfort of your kitchen, this recipe will be a family hit in no time. Preheat your oven to 425 degrees. Split the dough into two parts. Place one-half of the dough on a piece of parchment paper and press it into the desired shape/thickness using your hand. The dough will be very sticky, so you may need to put a piece of plastic wrap over it while you work it into position. Either place the second portion of dough in the fridge to use later or roll it out while the first pizza is in the oven. The toppings listed are enough for two pizzas. Once the cheese is melted, remove the pizza from the oven and place prosciutto strips directly onto cheese. Top with a handful of arugula. Serve warm. This recipe makes two crusts. 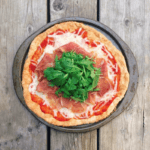 This low FODMAP arugula and prosciutto pizza will curb your comfort food cravings. If you like this recipe, subscribe to my mailing list below. You’ll get new recipes and articles delivered right to your inbox. Curious what else is happening in The FODMAP Formula kitchen? Follow me on Instagram for bonus recipes and a sneak peek at my latest experiments. Together we’ll get the Low FODMAP Diet down to a science!